Workers at the Waste Control Specialists facility in Andrews unload a shipment of ‘transuranic waste’ that arrived for temporary storage on April 2 from New Mexico. In a meeting with Andrews civic leaders, Waste Control Specialists representatives recently floated the idea of storing high-level radioactive waste at their local collection site, if the community approves. "It is something that if we had the community support of, at WCS we would be interested in being a part of that," said Chuck McDonald, a spokesman for the company. The conversation is in early stages, and company officials have sought none of the federal permits that would be required for the significant expansion of the sort of waste it handles, McDonald said. He said the company wants to temporarily store spent nuclear fuel rods, a high-level nuclear waste. Temporarily could still mean decades, but that is opposed to permanently disposing of the waste by burying it for millennia. The topic first came up at a March closed-door meeting of the Andrews Industrial Foundation, a non-profit economic development group, attendees said. One of them was Andrews County Judge Richard Dolgener, who said "we are moving very slowly" and that conversation focused mostly on political and industry context instead of support for the possibility of bringing the waste. "We are trying to get all our facts really more than anything before you start saying this or that," Dolgener said. The dialogue begins amid two other developments involving an expanded radioactive footprint in Texas, a prospect that concerns environmental groups but also some who advocated for bringing WCS to West Texas as a low-level collection site, such as Rep. Tryon Lewis. The first development is a series of proposals by state leaders: Gov. Rick Perry at the end of March wrote a letter to leaders of the state House and Senate that stated "We have no choice but to begin looking for a safe and secure solution for [high level waste] in Texas. . ." accompanied by a 48-page report from the Texas Commission on Environmental Quality that lays out some historical background about storage attempts and options. Perry’s letter used the phrase "Texas solution," which happens to be the slogan of Waste Control Specialists. But Perry recommends no specific storage site, and others in West Texas have also expressed interest in storing higher-level radioactive waste, such as officials in Loving County. The governor’s letter follows a charge by House Speaker Joe Straus to the House Committee on Environmental Regulation to study bringing high-level radioactive waste, including the rules and economic impact, and then "make specific recommendations on the state and federal actions necessary to permit a high-level radioactive waste disposal or interim storage facility in Texas." Another development is the radioactive waste that began rolling into Andrews County earlier this month from New Mexico. That waste is called "transuranic waste" that WCS was already licensed to handle, but the DOE requires that it must be handled more cautiously than the low-level waste WCS was designed to mainly deal with. Most of the transuranic waste consists of items like clothing, tools, rags and soil contaminated with radioactive elements during decades of nuclear research and weapons production in New Mexico. The temporary storage of the transuranic waste results from of a series of mishaps at New Mexico facilities, but it also expands the scope of the sort of waste WCS anticipated dealing with, McDonald said. "Certainly it doesn’t hurt the case that this would be a good place to take care of some of the spent nuclear fuel storage capabilities that are now becoming a pressing issue," McDonald said. 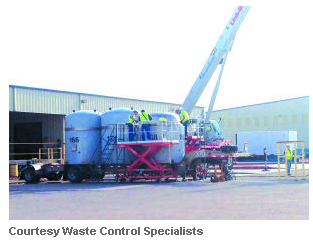 In an announcement of the first transuranic waste shipment on April 2, the Department of Energy reported up to about 100 more shipments will be sent to West Texas in an initial ramp up with as many as 10 shipments arriving per week before the June 30 deadline to remove the waste from the Los Alamos National Laboratory as part of an agreement with the state. At first, the waste was meant to go to the Waste Isolation Pilot Plant in Carlsbad, N.M., known as WIPP. But those plans were scuttled by a shutdown at WIPP after a small above-ground leak on Feb. 14 that reportedly exposed 17 workers to radiation. WCS, a private collection site, became the next option. WCS will be paid up to $8.8 million to store the transuranic waste, the DOE reported. Karen Hadden, executive director of the Sustainable Energy and Economic Development Coalition based in Austin, opposed moving the transuranic waste to WCS and said it seems like a step toward higher-level waste storage. "It’s kind of never-ending," Hadden said, describing the federal and state decision as rushed and then criticizing the potential for higher level waste. "There is higher potential for accidents. They are not frequent but they do occur and you don’t want that to happen . . . It’s incredibly dangerous material." Lewis, whose term as representative expires in January, said he has "no problem at all" with the transuranic waste storage. At an Odessa Chamber of Commerce event earlier this year, he also described his work helping to bring WCS to Andrews as one of his proudest legislative accomplishments. But Lewis also serves on the the House Committee on Environmental Regulation, and he says he opposes depositing high-level waste in Texas and that even storing it long-term is a bad idea. "I don’t think that is what that site is meant for," he said, even though he said the site and its workers could probably handle the waste. "Just to make money I don’t think it’s worth it to do that. Hey, let’s make a quick buck. I don’t think it’s worth it because you never know." Instead, Lewis said the spent fuel rods from the country’s 104 nuclear power plants should be buried deep in a geological repository, at the Yucca Mountain site in Nevada. The federal government designated Yucca Mountain in 1987 and after decades of controversy abandoned development before Congress finally cut off funding in 2011. More than $15 billion had been spent. McDonald said federal licensing and construction to store higher-level radioactive waste at WCS could happen in as little as seven years but that would all depend on community support. Lewis said he worries an attempt to even temporarily store radioactive waste at WCS could turn into such a boondoggle as Yucca Mountain. But if it happens, he said, there should be intensive review and consultation with locals. The county judge said so too: The first time around the community embraced the plant because they saw evidence of safe storage, but it is hard to predict sentiment now because so many have moved to the booming area since then. The county sees a windfall of 5 percent of gross revenue from low-level waste at the storage site, where space inside runs up to $10,000 per cubic foot. The state’s is about 25 percent. Storage of higher-level radioactive waste would probably bring more money to the county as well as skilled workers and greater economic diversification, say the judge and Westley Burnett, director of economic development at Andrews Economic Development Corporation who also attended the meeting with WCS. But Dolgener also said higher-level storage would bring other issues such as security and more deadly material. "It’s like having a milk plant and somebody wants to come and make ice cream because you’ve got a plant right there," Dolgener said. "But that’s really a big statement, because you’ve got to take science and law and 15 million other things into account to make that work."